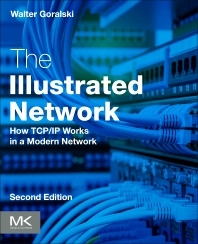 The Illustrated Network: How TCP/IP Works in a Modern Network, Second Edition presents an illustrated explanation on how TCP/IP works, using consistent examples from a working network configuration that includes servers, routers and workstations. Diagnostic traces allow the reader to follow the discussion with unprecedented clarity and precision. True to its title, there are 330+ diagrams and screenshots, as well as topology diagrams and a unique repeating chapter opening diagram. Illustrations are also used as end-of-chapter questions. Based on examples of a complete and modern network, all the material comes from real objects connected and running on the network. The book emphasizes the similarities across all networks, since all share similar components, from the smallest LAN to the global internet. Layered protocols are the rule, and all hosts attached to the Internet run certain core protocols to enable their applications to function properly. This second edition includes updates throughout, along with four completely new chapters that introduce developments that have occurred since the publication of the first edition, including optical networking, cloud concepts and VXLAN. The Socket Interface: Good or Bad? Walter Goralski has worked in the telecommunications and networking industry all his professional life. He has worked with and programmed WANs, LANs, and inter-vendor communications systems. He has been a programmer, project manager, communications cabling specialist, consultant, course developer, technical trainer, and university professor at the graduate level. He joined Juniper Networks in 2000 after 8 years as a technical trainer and currently holds the title of Technical Lead in the Information and Learning Experience department. Goralski is the author of 15 books about networking technologies.